The recently started European research project PECUNIA (“ProgrammE in Costing, resource use measurement and outcome valuation for Use in multi-sectoral National and International health economic evaluAtions“) aims to establish standardised costing and outcome assessment measures for optimised national healthcare provision in the European Union. Coordinated by Professor Judit Simon at the Medical University of Vienna, the three-year-project brings together ten partners from six countries with complementary methodological expertise. The European Commission’s Research Framework Programme Horizon 2020 has funded € 2.99 million for PECUNIA. 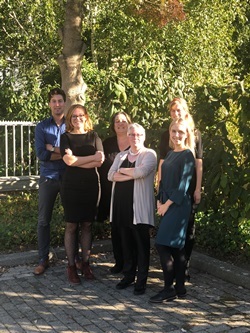 The Maastricht team – Prof. Silvia Evers, Prof. Carmen Dirksen, Dr. Aggie Paulus, Dr. Ruben Drost, Luca Janssen, Irina Pokhilenko, and Leonie Bremmers – is now complete and will develop internationally standardised methods and tools for intersectoral costs (e.g. the criminal justice sector and the educational sector). Additionally, Maastricht University will provide a uniform measurement method for each partner to use. Finally, together with Erasmus University Rotterdam, harmonised country-specific unit costs for all sectors will be provided. Picture from left to right: Dr. Ruben Drost, Luca Janssen, Prof. Silvia Evers, Dr. Aggie Paulus, Leonie Bremmers and Irina Pokhilenko.